Builtin push button start-stop station that control’s a magnetic contactor that is included inside the control panel. With this setup your converter can not self start itself if there was a single phase power loss and the power came back on. You would need to repress the start button to restart the converter. Some manufactures use a on-off switch but with this setup your converter and your load would try to power up at the same time when the single phase power came back on. which could lead to having problems with the converter or your load or both. 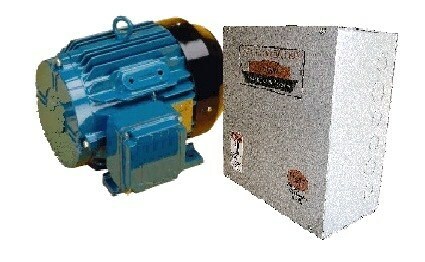 Builtin magnetic contactor which is used to control your converter. Voltage sensing relay that controls the starting circuit of the rotary phase converter. Heavy duty electrical terminal block that connects your idler motor to your control panel.